Egerton appeared at Macclesfield Magistrates on 15 April 2015 and was found guilty for 'unlawfully attempting to take fish in water in which there was a private right of fishery'. He was also found guilty as he 'fished or took fish otherwise than in accordance with a licence by means of a rod and line'. Dilip Sarkar Angling Trust National Enforcement Manager said: 'This is an excellent result and a great example of what we are all collectively achieving through the Fisheries Enforcement Campaign: raising awareness within the police service and beyond to the wider public, increasing confidence and intelligence - and all involved working together. On the eve of the General Election the Angling Trust has acknowledged the 'sterling work' of seven MPs from the Conservative, Labour and LibDem parties in pressing for measures to save threatened bass stocks. The MPs have all been raising the bass issue in debates in the House of Commons, by tabling parliamentary questions and in direct representations to ministers. All have been sent a special certificate, decorated with the stunning picture of 'Bass on the Fly' by renowned angling artist David Miller. The group includes former fisheries ministers Richard Benyon (Con) and Ben Bradshaw (Lab), both of whom have called for bass to be given priority as a recreational species; the chair and vice chair of the All-Party Parliamentary Group on Angling, George Hollingbery and Charles Walker, who have organised Commons debates to press for bass conservation measures with strong support from Simon Hart for the Conservatives and Labour's policy chief Jon Cruddas. The LibDem MP Annette Brooke has been a persistent letter writer on the issue as have a number of others. The Angling Trust is highlighting the plight of British bass stocks as a general election issue by encouraging anglers to write directly to their local candidates to seek their support for a package of conservation measures to ensure that stocks recover. The Trust has also produced a special briefing for all candidates and MPs available HERE. It was nice to catch up with Les Webber MBE at the recent Big One Show. He campaigns tirelessly for his excellent Angling Projects venture, which I've always been happy to promote on this site. Open to schools, youth clubs, scouts/guides, junior angling clubs, and kids at risk or with special needs, this complex offers children the chance to have a go at our sport and as their own catchline says 'Get kids hooked on fishing not on drugs and crime'. So it was sad to hear from Les, who recently became patron of the Kevin Green Angling Academy, that the Angling Projects centre had been broken into the other week, with a lot of equipment and tackle stolen, and most frustrating was the damage done to the main building and surrounding facilities. But on a more positive note it was nice to be around when the Perchfishers Group presented Les with a cheque for £1,000 to help bolster the Angling Projects funds. Represented by the group's president Des Taylor and press officer Paul Thompson, the donation was in memory of Richard Chanderman, who sadly passed away before the publication of the group's book The Biggest Fish Of All, and it was felt that Angling Projects would be a worthy recipient of this collection. This is the first time that Article 12 of the reformed Common Fisheries Policy has been invoked due to, 'A serious threat to the conservation of marine biological resources..'. 'This is a great day for Dicentrarchus Labrax, the fabulous European Sea Bass, and what we have been working so hard and waiting so long for. We also look forward to the production of a long term management plan for bass, which will lead to healthy stocks of all sizes of bass for the benefit of everyone who uses this stock sustainably. The National Crucian Carp Project has this week launched a new information video aimed at encouraging angling and fishery interests to embrace crucian conservation and draw up plans for more crucian waters in their areas. The video is also part of a new episode of the Fishing Britain series produced by the YouTube channel FieldsportsChannel.tv and features the Angling Trust's Martin Salter as a guest presenter. The video, which features scenes from Catching the Impossible, was filmed at waters belonging to Newbury and Godalming angling associations and shows crucians from the Environment Agency's fish farm at Calverton being stocked into new waters that will be developed as future Crucian fisheries. Last week’s parliamentary debate on the management of bass stocks saw a remarkable change in tone from the usual debates which, in the past, have been dominated by apologists for commercial over fishing. Wednesday’s Westminster Hall debate was secured by the Conservative MP George Hollingbery, Chair of the All Party Parliamentary Group on Angling, and received strong support from both sides of the House of Commons with powerful speeches in favour of bass conservation measures from two former fisheries ministers – Richard Benyon (Con) and Ben Bradshaw (Lab). George Hollingbery described the current policy of unlimited exploitation, which has now caused experts call for an 80% cut in bass landings to avert a stock collapse, as ‘dumb as dirt’. Richard Benyon expressed regrets that he did not ‘steamroller a higher bass minimum landing size through’ when he had the chance. An immediate increase in the current minimum landing size from 36cms to 45 - 48cms in order to allow bass to successfully reach at least their first spawning size of 42cms and to have time to complete their life cycle. An end to commercial harvesting during the spring spawning period, restrictions on pairs trawling and trammel netting and reductions in catch limits per boat. A significant expansion in estuarine bass nursery areas where juvenile fish can be afforded greater protection. Rejecting the proposed one fish bag limit on anglers as unfair, disproportionate and unbalanced. Summing up the debate Conservative Fisheries Minister George Eustice MP pledged to press for tougher measures at the EU December Fisheries Council to protect bass and rejected the proposed one fish bag limit on anglers. The Angling Trust is working with the Marine Conservation Society to ensure that these issues are raised again in the Annual Fisheries debate in the House of Commons on December 11th which precedes the European Fisheries Council meeting the following week. I returned to Puddledock Farm Fishery the other day to be at the official launch of The Kevin Green Angling Academy (South). Brought about because of the sad loss of the popular angling journalist and broadcaster Kevin Green in late June 2013, this undertaking is all about starting a living legacy that will embody Kevin's own enthusiasm for passing on his angling knowledge and skills. I myself wasn't quite sure of exactly what, and how, this Academy would actually operate, but this became a lot clearer when I was told about the new 'hut' that will soon be built, and permenantly sited, within the grounds of Puddledock Farm, who's management have themselves shown overwhelming support for this great initiative. It will be a centre of learning, a classroom, to teach people about all things angling as well as a base for the Academy in this area of the country. And on that point it was great to hear the gossip that this is just the first one, and that other Academy's will eventually open across the country. Why was the Kevin Green Angling Academy (South) founded? Because like the late Kevin Green - we care - not just about fishing but for the people - primarily for one section of the community - the disadvantaged, regardless of reason. Like Kevin, we recognise the role the sport can play in improving health and wellbeing. Helping the body recover from conflict and illness, the mind from stress and trauma, and the person from poverty and exclusion. In Kevin's honour, we work with a wide variety of organisations to provide tailor made opportunities with qualified, professional coaches, dedicated classroom facilities and the use of a large multi-lake fishery, providing experiences that would otherwise be out of reach for many. Jo Green is presented with a beautiful bouquet, not that her boys seem that impressed! As guest of honour it was great to see Kevin's wife Jo Green, with their two boys Reuben and Theo, plus Kevin's dad Ken, who also made the journey down to Upminster. Their presence gave the launch a poignant link to Kevin and it was lovely to see Jo receive a beautiful bouquet of flowers, while Reuben was presented with a framed picture showing the moment he caught his first fish at the Kevin Green event at Lemington Lakes a few weeks ago. 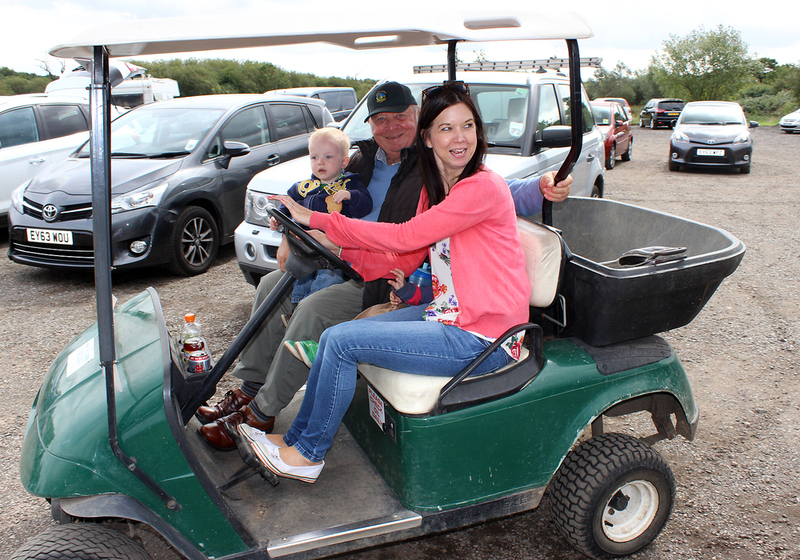 After a few good natured speeches from Martin Roessler, Naidre Werner and Dr Bruno Broughton that officially introduced us to the Academy and its aims, it was time for a tour of the venue and Jo was encouraged to drive herself and her family around in one of the owner's golf buggys... think the kids were loving it! More backing from Bait-Tech... and you just know the contents of this bottle are going to stink! It left me to chat with some of the Trustees and their enthusiasm for the project was fantastic, they really want to this to succeed, and with sponsorship from National Fishing Month, the Professional Anglers Association, Angling Trades Association, Sport England, Diawa, it has some great backing. And just to prove a point I found out that there was a coaching session being held on one of the lakes even while the launch was taking place! So I'll keep you guys up to date as the Academy grows, and I for one would like to wish them well. Here's a few contact numbers/links if you'd like more information on the KGAA. And if you'd like to make a donation click here. Environment Agency enforcement teams continue clamping down on rod licence cheats, notching up more than 13,000 licence checks across England in May. Of the 13,000 anglers checked for a valid licence, 965 were fishing illegally and could face a court appearance and a substantial fine. A recent penalty was more than £800 when an annual licence costs just £27. May falls within the coarse fishing ‘close season’ – which runs from 15th March to 15th June – when coarse angling is suspended on rivers and a few canals and lakes in order to allow coarse fish to breed. While some licence cheats were also fishing rivers during the close season, the majority were caught on stillwaters where fishing is still allowed during these months. One Environment Agency enforcement officer reported an angler for fishing with three rods on one licence (each licence covers up to two rods). The angler was particularly aggressive because he had been caught in same place for the same offence last year. In another case an angler gave a false identity and nearly ended up being arrested. The following day the same angler was checked at a different fishery but had subsequently bought two valid rod licences. What’s more, he was fishing with several other anglers and had informed them that the bailiffs were about – his fellow anglers told the officer they had been tempted to fish without a licence but, on the advice of their friend, had bought one that morning online. Sarah Chare, head of fisheries at the Environment Agency, said: “The number of anglers caught red-handed is testament to the hard work of our enforcement teams. But worryingly it still shows a blatant disregard for fisheries and the environment. People who don’t buy a licence are cheating other anglers and the future of the sport. The Environment Agency relies on the income from rod licences to continue the important work we do to protect fish stocks, improve fisheries and encourage more people to take up fishing. In addition to the Environment Agency’s rod licence enforcement work, which focused mainly on stillwaters, Angling Trust voluntary bailiffs were also patrolling rivers to detect and report any close season and other fisheries offences. Environment Agency officers were able to respond to their reports and all the intelligence information gathered will help inform future enforcement patrols – they will know who is likely to be fishing illegally when and where. Last year, Environment Agency officers checked more than 70,000 licences and prosecuted more than 2,800 licence cheats. Between them, they were ordered to pay fines and costs in excess of £600,000. To help crack down on unlicensed fishing the Environment Agency urges anyone to report illegal activity by calling 0800 80 70 60. Money raised from rod licence sales is reinvested in the environment, including a whole range of projects to improve facilities for anglers, protect stocks from illegal fishing, plus fish restocking, invasive species eradication, and working with partners to encourage people to take-up fishing for the first time. Annual rod licences for trout and coarse fishing remain at £5 for 12 to 16 year olds, £18 for senior and disabled concessions and £27 for non-concessions. Children under 12 can fish for free. Buying a licence online from the Post Office website saves time and administration costs, which means more of the income can be spent on improving fish stocks and fishing. Rod licence prices have remained unchanged for the last 4 consecutive years. Anglers can also buy a rod licence by calling the Post Office on 0344 800 5386 or by visiting any Post Office branch. Alternatively, you can buy your licence through the Angling Trust’s mobile-configured website – www.fishinginfo.co.uk. Whether at home or on the move, anglers can use this new website to get details of thousands of fisheries, tackle shops, clubs and coaches, plus all the latest angling weather and river levels. Mums and families are being encouraged to give dad the perfect gift this Father’s Day – get him fishing! The Father’s Day special promotion is part of the annual TAKE A FRIEND FISHING (TAFF) campaign, organised and run by the Angling Trades Association in association with the Environment Agency and supported by Angling Trust fishery members. The 2014 river coarse fishing season starts the day after Father’s Day, and Environment Agency annual rod licence holders can take a friend or family member fishing with them for free from 16 June to 22nd June inclusive.